WILLIAMS LAKE, BC: Effective at noon on Monday, April 15, 2019, Category 3 open fires will be prohibited throughout the Cariboo Fire Centre to help prevent human-caused wildfires and protect public safety. * burning of stubble or grass over an area greater than 0.2 hectares. Anyone conducting a Category 3 fire anywhere in the Cariboo Fire Centre’s jurisdiction must extinguish any such fire by noon on April 15, 2019. This prohibition will remain in place until Sept. 27, 2019, or until the public is otherwise notified. This prohibition does not ban campfires that are half-metre high by a high-metre wide or smaller, and does not apply to cooking stoves that use gas, propane or briquettes. This prohibition also does not ban Category 2 fires, which include one or two concurrently burning piles up to two metres high by three metres wide, or the burning of stubble or grass over an area less than 0.2 hectares. 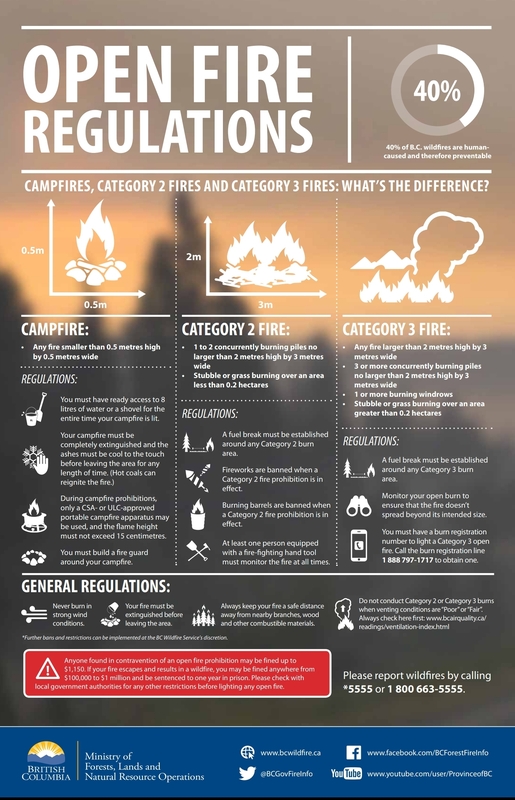 Poster explaining the difference between category fires, including campfires. BC GOV. The Category 3 open burning prohibition applies to all BC Parks, Crown lands and private lands, but does not apply within the boundaries of a local government that has forest fire prevention bylaws in place and is serviced by a fire department. Check with local government authorities for any other restrictions before lighting any fire. Anyone found in contravention of an open burning prohibition may be issued a violation ticket for $1,150, required to pay an administrative penalty of up to $100,000 or, if convicted in court, fined up to $100,000 and/or sentenced to up to one year in jail. If the contravention causes or contributes to a wildfire, the person responsible may be ordered to pay all firefighting and associated costs, as well as the value of the resources damaged or destroyed by the wildfire.